A well-staged visit to the Forbidden City; adoring crowd, a fawning host in the form of Premier Li Keqiang; a rare opportunity to address the Central Party School of the Chinese Communist Party: a departure from protocol in breaking bread with a retired leader; half a step forward in keeping the disputed border quiet. 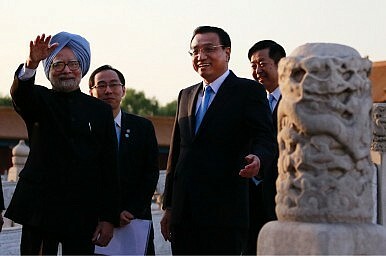 Prime Minister Manmohan Singh's two-day China visit last week was high on atmospherics, low on substance, but Singh himself was satisfied with the incremental progress that he managed to achieve. Speaking to accompanying media on board Air India One after concluding the visit, Singh said: "In China, my visit was to follow up on the process of getting to know the new Chinese leadership better. China is our largest neighbour, a significant economic partner and a country with increasing global presence. While we have our differences, there are many areas, bilateral, regional and multilateral, where cooperation among us is to our mutual benefit. It is only through a process of intense engagement that we will be able to move forward in all areas. I am satisfied that my just concluded visit has served its purpose." Not everyone will agree with the assertion but the centerpiece of the Indian Prime Minister's trip was undoubtedly the Border Defence Cooperation Agreement, or BDCA, which laid down more communication between tactical and strategic commanders and even at higher level between representatives of defense ministries of both the countries, hinted at a proposed 'hotline' between military headquarters and formalized an understanding on "no tailing" of troops when they come face to face on the long border. A closer scrutiny of the agreement, however, reveals that it has only managed to add layers to the already existing mechanisms to maintain peace and tranquility on the border. Many of the provisions were already discussed and included in earlier agreements. For instance, Article IV of the BDCA, 2013 states: "In implementing border defence cooperation and to facilitate contacts and meetings between relevant organizations, the two sides may establish Border Personnel Meeting sites in all sectors, as well as telephone contacts and telecommunication links at mutually agreed locations along the line of actual control. The two sides may also consider establishing a Hotline between the military headquarters of the two countries. Specific arrangements shall be decided upon through mutual consultations between the two sides." (3) To establish step-by-step medium and high-level contacts between the border authorities of the two sides. Privately, Indian officials say two more border meeting points have been identified at Lipulekh in the central sector of the Line of Actual Control and the other at Kibithu (Dichu) in the Eastern Sector. And yet, as noted China specialist, Professor Srikanth Kondapalli has written: "Subsequently, at the 9th JWG meeting in Beijing in October 1996, two more annual military meeting points at Lipulekh in the Central Sector and Dichu in the Eastern Sector at the Major General level were finalised."